At 74-minutes (without credits), it’s not hard to look back on Chicken Litte as nothing more than the opening shot to the modern world of 3D. This was the first one to come from Disney, a studio now at the forefront of the technology, although thankfully with Pixar in control. Little was also their first computer animated feature without the famed studio, and, well, they have Pixar back now so let’s move on. The title of course refers to the classic “sky is falling” parable, but tosses in planet-slaughtering aliens and pop culture-rich songs… lots of pop-culture rich songs. With so little time to spend developing every element of this plot, it’s baffling how much of it can be wasted trying to entertain an audience with familiar music. It’s like creators expect the audience to have a light bulb go off thinking, “Hey, I know that song!” That’s not funny though. Admittedly, that is a little harsh on Chicken Little. Despite its woefully outdated and stiff animation, this is a cute feature. The world is comprised of various animals, their large eyes backed by familiar voice actors (Don Knott’s final film for those paying attention) and a couple of genuinely funny moments. At Little’s heart is a movie about acceptance, C. Little rejected by the community after a failed warning about the sky falling on his head. It’s all well and good, no doubt brisk even with the musical interludes. The action is frantic, and you have to love some of the subtle references including the “Mickey Mouse Club” as some cars are run over. Comedic timing is there, if not the material. Little is desperate for a dose of wit, choosing to run the gamut of 2005 culture instead. There’s a rousing finale here, aliens descending into this little town in search of their lost child. There are some sight gags, some laughs centered around panicked citizens, and some closure on the key story elements too. The energy displayed is what the whole film needed and just can’t find. An early reference title that showcased everything Blu-ray can do, time has not been as kind, although neither has the quality of modern animation. This is far from terrible though. As expected, definition is outstanding, feathers, fur, and even scales are effortlessly defined and crisp. Sharpness is stunning. Near the end of the second act, Little is sitting in his backyard, thousands of grass blades completely visible as individuals. The seats of the car are cracking leather, and the various trees in the outdoor landscapes are just as defined. Clarity is of course meticulous, free of unsightly artifacting. Even the shaded skies are free of banding, a rare feat for any piece of animation. Only some strong spotlights inside the alien ship cause any problems, and there it’s so minimal you can easily miss it. Colors quickly establish strong primaries, coming to added life during the baseball game. The bursting red helmets of the team are outstanding, backed by golden browns for the infield, and bright blue sky behind it all. And yes, the grass is equally fulfilling. They never reach a real intense saturation, yet remain pleasing. A slight bit of interlacing is noted, so minor it was barely worth mentioning. The score book of the baseball announcer is probably the worst of it. Where the transfer tends to fall flat (somewhat ironically) is dimensionality. It’s mostly the animation itself, lacking a real punch. Darker areas of the screen are bland, even at night in a cornfield. It needs a bit of a punching up, shadows need a better impact, and shading in general requires more of a kick. For 3D animation, this feels more like 2D, the generous helping of the resolution Blu-ray provides still not enough. For a newcomer to the format, you can’t really argue this remains a highlight. 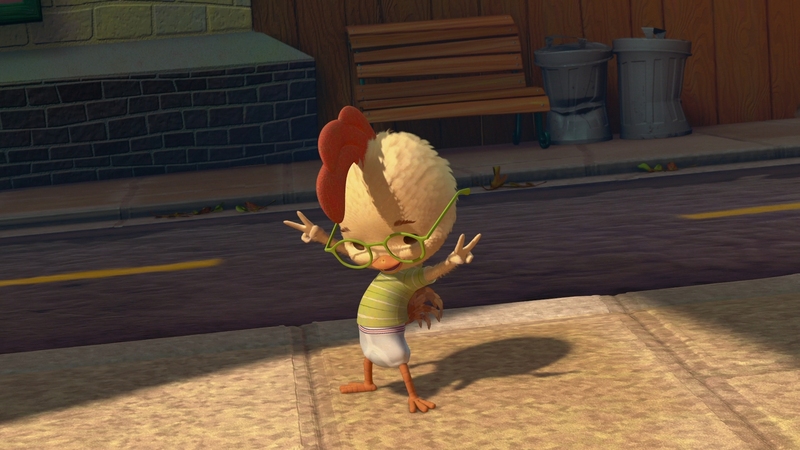 Let’s face it: Until the Pixar releases started flowing with regularity, Chicken Little had a lot going for it. It’s only under direct comparison does it flounder a bit, but only those with some deep experience involving Blu-ray will even care. What hasn’t aged is this spectacular PCM effort, another relic of early Blu-ray that doesn’t see much use anymore. Little opens on spectacular panic, Little’s call blaring around with a swirl effect. The town erupts, and a water tower comes crashing down, landing in place with a fantastic thud. Before that, it rolls a bit, passing through the soundstage with immense accuracy. Stereos split wide, capturing motion and dialogue in the appropriate channel where needed, and it’s needed a lot. The dodgeball game adores this opportunity, thrown balls scattering around front to back with ease, bouncing against their target or the wall in the fronts. Swirling winds and an alien assault on a cornfield are just a few other moments where this thing turns into audio bliss. Little still has more to give, with its reference finale pushing alien walking crafts through every channel at will, and laser death beams into the low-end. It’s not quite War of the Worlds, but for a kids movie, this is as close as it gets. A pop-up feature stills remains unique, this allowing a viewer to select certain questions to “ask” the filmmakers, and an appropriate feature will play. You can also set this to auto, and it will play a scene-appropriate bit. There’s also a commentary featuring director Mark Dindal, producer Randy Fullmer, and visual effects supervisor Steve Goldberg. Deleted scenes (x8) each have an introduction, running through everything totaling up to almost 30-minutes. A couple of sing-alongs are followed by a routine Blu-ray game. DVD carry-over features include a making of called Hatching Chicken Little, five sections for 18-minutes of material. A couple of easter eggs (not anymore as they’re right in the menu selections) are animation shorts. There’s also a Movie Showcase section that takes you to the best parts of the movie visually and sonically.